Sweet as always is the language of human rights, but I do not like the way it characterizes the issue of humans and rights. As if, as the notorious quote from George Bush Jr, “you are either with us or against us”. As if, when they say “universal human rights”, they don’t include the Muslims. I must stress first that Islam sees this issue very differently, and the derivative products may be very different also and difficult to understand and therefore it is essential to get this straight first. So probably the commentary towards this first commitment will be the longest so please hear me out until the end. While international human rights see everything to be all about ‘rights’ with the duty being “to respect other people’s rights” (which means that the highest rule is ‘rights’), Islam is different. Islam is duty based. Humans are born with obligations, as Allah is our one and only Deity and we are His ‘Abd. He commands and we oblige, so the most fundamental to us are DUTIES. However, He is Al-Rahman so we have some rights by the virtue of His Mercy alone, and He is Al-Rahim so we have other rights if we deserve them. This is a clear indication that worship is an obligation instead of a right. Even from here we could imagine how different the consequences would be. Surely this debate on natural law could go on for centuries, I myself have –to some extent—criticized that school of law. 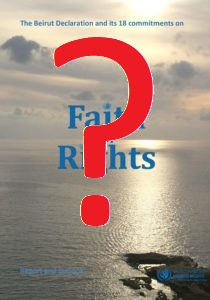 However, the first point to be made is that in the Islamic view it is difficult to see religion as a ‘right’. I think everyone would agree that there cannot be a right to abandon one’s obligation. The second point to be made is that the consequence of this is that a Muslim cannot acknowledge that there is a right to not worship Allah. There is no shortage of verses of the Qur’an and sayings of Prophet Muhammad PBUH to show that disbelief is not a right, and instead promises a plentiful different variety of punishments in the hereafter. To name a few, one can refer to the Qur’an in Surahs Al-Azhab verses 64-68, Surah An-Nahl verse 88, Surah Al-Baqarah 161-162. The third point to be made is that “Worship me”, in Islam, must be through the way Allah commands it. This is Islam. Every religion has its truth claim, and this is Islam’s truth claim manifesting itself in derivative issues. There is also no shortage of evidence from the Qur’an and Sunnah on this matter, one can refer to the Qur’an in Surahs Al-Tawbah verses 30-31, Ali Imran verse 21, Al-Maidah verses 17, 72 and 78, Al Bayyinah verse 6, and Surah Al-Baqarah verse 62, just to name a few. This is why the quote by Rumi at the beginning of the document “There are as many paths to God as there are souls on Earth” (which sounds awfully similar to the ancient Roman proverb ‘all roads lead to Rome’) is such a statement of kufr. Unless, of course, it is understood to mean that Islam teaches a plentiful of different ways to worship Allah without any prejudice to the fundamental commands. The fourth point I wish to make is equally important, which is that this does not mean that Muslims can just therefore kill or punish or force non-Muslims simply due to their mere disbelief towards Islam. This is where the famous Al-Baqarah verse 256 “there is no compulsion in religion” comes in. There are numerous evidences from the Qur’an and Sunnah to show how it is a sin and even crime to kill a non-Muslim unjustly (just killing would include killing in the battlefield or in the conduct of death penalty for serious crimes etc). However, it is essential to not misunderstand these verses to mean that there is a right to disbelieve, but that there are other better and more noble ways to spread the deen of Islam which Allah commands. So its not that there is a right (in the sense that it is an entitlement which is haqq or correct), but rather punishment for disbelief is left to the hereafter while the disbelievers in this world are still given time to start fulfilling their obligation to worship Allah in the manner which He commands. Having that said, I hope the readers of this commentary will not misunderstand me if I say that Islam does not endorse the freedom or rights to believe in whatever they want. Rather, Islam has another concept called tasammuh. Often translated to ‘tolerance’, the true meaning of this word is some sort of ‘to let be’. In other words, Muslims have no rights to harm non-Muslims (and in fact must treat them kindly and justly) despite the non-Muslims not having rights to disbelieve. I get the point, in the end it still means that Muslims should not harm or even nag non-Muslims for their faith (or lack of it). However, I am not a fan of the way it is constructed as a ‘right’. If this is understood to mean that there are rules (external rules agreed by those in the Declaration) that Islam and Muslims has to follow, then this is kufr. No way can Islam tolerate this, and no Muslim can agree to this. See: Surah Al-Maidah verse 44, 45, 47, 50, and many other verses. I must make a little jump to COMMITMENT VIII here, which says TO MONITOR INTERPRETATIONS, DETERMINATIONS OR OTHER RELIGIOUS VIEWS THAT MANIFESTLY CONFLICT WITH UNIVERSAL HUMAN RIGHTS NORMS AND STANDARDS which does not say explicitly but heavily implies that this ‘universal human rights norms’ would be a standard from which religious interpretations must be made. What is this ‘universal human rights norms and standards’? Does it refer to ‘international human rights law’ as per Commitment VI (which I will comment on later)? However, if this means that there are certain standards which are coincidentally believed by all faiths then I guess why not. The next step is to then make sure that Islam is presented honestly and completely so that this ‘minimum standard’ includes everything that Islam teaches. In order to do this, one must certainly include ALL standards of ALL religions and hope that none of those contradict each other. Or, in this context, ALL Islamic teachings must be included without any exception. Maybe other religions can have some compromise within their doctrines. For example, the Catholic Church used to have the Salus extra ecclesiam non est doctrine. No salvation outside the church. However, as explained by scholar Dr Syamsuddin Arif, in 1962-1965 they seemed to have a critical reconsideration towards this doctrine through the document Decretum de Ecclesiae Habitudine ad Religiones Non-Christianas (or Nostra Aetate) issued by the Catholic Church in 1966. This is not to mention the issue of secularization. Muslims, on the other hand, do not have this attitude towards their fundamental theological doctrines except some rogue ‘scholars’ which are criticized and abandoned by the overwhelming majority. Note that no ‘Muslim representative’ could ‘represent Islam’ and agree upon modification of Islamic doctrines. Can such a ‘minimum standard’ be made, all-inclusive? In theory, it can. However, as my commentary towards Commitment I shows, I am not sure that this document is managing to do this. Let us see the other Commitments. Turning back to COMMITMENT VIII again. If this ‘universally agreed human rights principles and norms’ is understood to mean ‘certain standards which are coincidentally believed by all faiths’, then sure. This only means, in other words, Muslim scholars must monitor interpretations by groups or individuals to make sure they do not contradict the proper teachings of Islam, which is already been going on for over a millennium throughout the history of Islamic scholarship to this date. And, in that purpose, who ever persons were involved in the Beirut Declaration and the 18 Commitments are among those who will be ‘smacked’ through this monitoring process! I have encountered much of this especially during my stay in the United Kingdom for my Masters between 2013-2014. I been participating in external multifaith talks organized by the Edinburgh Interfaith Association (EIFA) and the Alwaleed Center, or internal-university ones organized by the Chaplaincy of the University of Edinburgh. I met such wonderful people, such as Prof Hugh Goddard (Alwaleed Center), Ali Newell (Chaplaincy), and Iain Stewart (EIFA). Despite our major differences in religion, I really do respect their kindness towards us Muslims. After all, us Muslims in Edinburgh seemed to be living a relatively more peaceful life rather than those in England who seem to be facing persecution by racist groups like the English Defense League. However, it may seem that these events mean very different to me than what it meant for the organizers. Please bear with me because it will take some time to explain before rounding back to this point. I do understand how “mutual dialogue and understanding” does sound really sweet and nice and flowers and rainbows. However, there is something very insidious behind this which I am sure that most people do not really think about much (therefore I do not necessarily suggest any ill will on the organizers’ part). However, this ‘assumption of misunderstanding’ is something that I have really great trouble with. As a Muslim, maybe to think that every non-Muslim is secretly plotting to kill me or at least slip pork in my meal (the latter happened, actually haha) is probably a ridiculous paranoia. However, much of the things that I believe about the non-Muslims are actually taken from the Qur’an. Are they, then, suggesting that the Qur’an misunderstood the non-Muslims? Some of these alleged ‘misunderstandings’ include ‘Christians are not polytheists, rather they we are monotheists. The trinity is not a polytheistic belief.’ Prof Hugh Goddard said this to me directly when we were playing some ice-breaking games in one of the EIFA – Al-Waleed Center events, and I have heard this also repeated by many other Christians. I do not hold this against them, as this is truly what they believe so they are merely reiterating their faith. However, our scriptures understand this perfectly fine and there is no misunderstanding. There are numerous references towards the doctrine of trinity in the Qur’an and how that constitutes as kufr according to the Islamic teachings. I will not go deep, but suffice to say that ‘monotheism’ is not equal to ‘tawheed’. The concept of tawheed in Islam is very specific and particular, so that anything less is still shirk (polytheistic) in the Islamic framework. For example, ascribing one (or more) of Allah’s divine characteristics towards a creation is enough to be called shirk. Whatever metaphorical understanding of the trinity that the Christians may offer, it will always fall under the Islamic criteria of shirk even if the said Christians self-identify as ‘monotheists’ (A concise explanation on the Islamic concept of tawheed can be read here.). The Qur’an always uses thalaatha to speak of the Trinity, so it encompasses whatever trinity concept that Christians say. With all due respect, the Christians may believe what they wish. That is not my business. However, I have witnessed what comes after ‘Christians are monotheists too’: “they are Muslims too”. The half reading of Surah Ali Imran verse 64 which I cited above, together with Surah Al Baqarah verse 62 read without the asbabun nuzul (and without reading basically every other verse of the Qur’an) seem to endorse this view. The only problem of scriptural misunderstanding is not on the Islamic scriptures towards the other faiths, but rather the misunderstanding of some Muslims towards their own scripture. I have known many who have fallen into the ‘Christians are monotheists too, therefore they are not kaafirs’ misunderstanding (and this is just one among many misunderstandings I have found). This is Muslims not understanding their own scriptures, thinking too simply that monotheism=tawheed. Ironic, because the same Muslims are usually among the first to say “terrorists misunderstand the Qur’an, because of their lack of holistic reading towards it”. Therefore, what these Muslims need is not a better understanding other scriptures but that of their own scripture (i.e. the Qur’an and Sunnah). From here, they would not only understand other faiths properly, but also learn how to position them and properly relate with persons of other faiths. They will understand the very clear line between the Islamic faith and that of others, while also understanding the necessity of treating others kindly and justly. Before someone complains, I wish to note that yes I do understand that some of these events are about cooperating in doing something which both faiths agree upon (e.g. charity etc) but I am specifically highlighting the constructive engagement on scriptural understanding. So why did I join these events before? What did I mean when I said “these events mean very different to me than what it meant for the organizers”? I believe that there are only two types of engagements which Muslims can have with non-Muslims. To mention the controversial one first, war. Surely this is only on certain situations, I am not saying that we should fight all the time but this is one type of the two of engagement I believe is known in Islam. The second engagement, which is most relevant to our current discussion, is da’wa or propagation of the message of Islam. A calling to the true path of Allah. For me, those forums were not so ‘I can properly understand their faith better’. Rather, it is so that I understand their followers better so I could try my best to share the message of Islam to them in the best way possible. Our EIFA – Al-Waleed Center had a session on “Protecting the Environment”, and alhamdulillah the Muslims shared very solid basis of environmental protection from our scriptures while the Christians had some struggle there. We also had a session on “Mercy and Forgiveness”, and spent quite a large portion on the Christians criticizing some of their own doctrines on the role of Priests in granting forgiveness. If we can work on something concrete together, such as doing charities, I guess why not? If they accept the message of Islam and join us as Muslims, alhamdulillah, and my job is just to share the message to the furthest extent of my capacity. If they do not accept? Then I leave them in peace with what they choose.